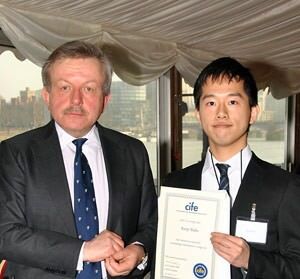 OSFC student Kenji Baba received a College prize from CIFE’s President Lord Lexden at the 2015 CIFE Awards held at the House of Lords this March. Kenji (shsown left with Lord Lexden) is the perfect blend of student. He is sensible, mature and intelligent, as well as humorous on occasions, and has left a lasting impression on his teachers at Oxford Sixth Form College. In mathematics Kenji has notably shone. He is hardworking, logical, accurate and extremely motivated to do well. Despite English not being Kenji’s first language, his powers of analysis are of an extremely high level and he has no problem in following, or in presenting, a coherent argument. Outside of academia, Kenji has shown great dedication and compassion by engaging with the wider community, as exhibited by his voluntary work in helping support victims of the recent Fukushima tragedy. Kenji has proven to be a most reliable and loyal student, who has shown great determination to succeed.